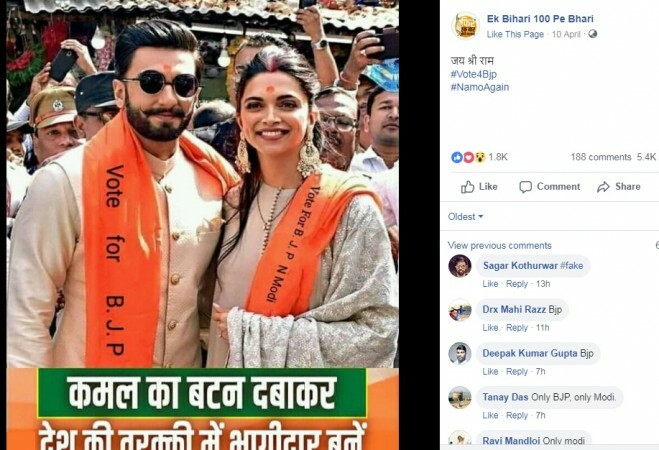 In the picture, Ranveer Singh and Deepika Padukone were seen wearing saffron scarves on which a text appealing for votes for BJP and Modi was being highlighted. 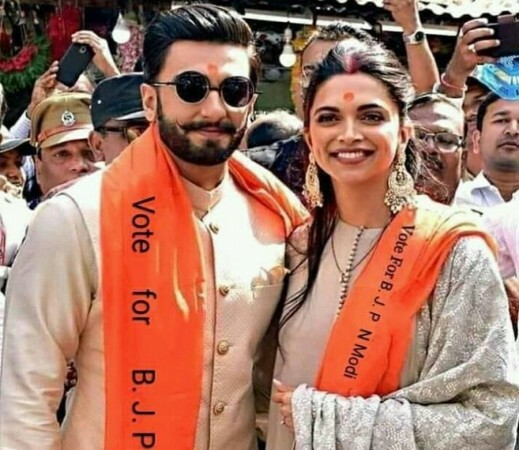 "Vote for BJP N Modi," read the text on Ranveer and Deepika's saffron scarves. Amidst the ongoing Lok Sabha Elections 2019, a photo of Ranveer Singh and Deepika Padukone campaigning for BJP and PM Narendra Modi had gone viral on the internet. In the picture, the couple were seen wearing saffron scarves on which a text appealing for votes for BJP and Modi was being highlighted. "Vote for BJP N Modi," read the text on Ranveer and Deepika's saffron scarves. But were they really campaigning for BJP and Modi? The truth about the the viral picture of Ranveer and Deepika wearing saffron scarves is that it was clicked on November 30, 2018 when the couple had gone to pay their visit to the Siddhivinayak Temple in Mumbai in coordinated outfits. The event was carried by several media outlets when the newly weds had gone to seek blessings at the temple. It has now been learnt that the particular image was photoshopped and was shared on a Facebook page by the name "Ek Bihari 100 Pe Bhari" which has about 38,192 followers till date. The post has garnered about 1.8K likes and 5.4K shares on the social media platform ever since it was shared on April 10 a day before the beginning of the first phase of Lok Sabha Elections 2019.